Why Am I Being Labeled a Spammer? - Ask Leo! Possibly being labeled a spammer is another reason not to forward jokes and urban legends. Do it enough and your normal email may not get delivered. As I write this, over 125,000 people have my email address. Probably more, but that’s the number of people subscribed to my newsletter. Right there on the “From:” line is an email address. Naturally, some of them will forward me jokes, virus warnings and other hoaxes or urban legends. I know that they mean well and do so with the best of intentions. But, I mark them all as spam. I have to. Because that’s what they are. Even if I don’t, others may, and because of that, there’s a very important lesson here in making sure that the rest of your email keeps getting delivered. In its purest form, SPAM is simply email that you didn’t ask for. It’s a very simple definition. An even more common definition – however inaccurate you might feel it to be – is that SPAM is any email that the recipient didn’t want. You can argue about it all you want (I know I often do), but the fact is that people will push the “Report Spam” button on just about anything that they don’t like. I’ll use Google’s Gmail as my example here. When a Gmail user hits “Report Spam” on an email that you sent, that’s a strike against your email account. That person is telling Google that email that looks like this is spam to that person. Of course, one of the biggest things that Google can look at as part of some definition of what “looks like” spam is the email address that the message was from. If that happens often enough or happens from enough different recipients on Google, then Google will start automatically marking email that looks like that as spam without needing to be told further. In other words, your email won’t get delivered; that includes not getting delivered to all the other people on Gmail that never once called it spam. This applies to Gmail recipients as well as those on Yahoo, Hotmail, and just about any email system that has a “Report Spam” or “Junk” reporting system. It doesn’t matter. You don’t get to define what is and is not spam; your recipient does. And by reporting spam, your recipients ultimately can affect whether or not your email makes it to others. I know that this doesn’t feel right, but it is what it is. 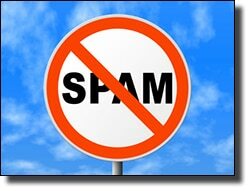 People want control over what shows up in their inbox and marking any unsolicited email as spam is one way to do it. I tried replying and asking people to stop forwarding me stuff. Not only does that take time, people got angry with me for daring to do so. No one wants to deal with angry people, but I still want to stop getting their forwards. So, one click and it’s marked as spam. I get on with my life. If it’s a one-shot email, it probably doesn’t affect anything. If it’s a repeat offender eventually Google will get the message and mark it as spam for me, removing it from the email that I need to see. As I said, people get angry when I reply. I expect that there are those who will get annoyed at what I’ve said here, blaming me for being too draconian in my approach to email I didn’t ask for. This is about all your other recipients who are doing exactly the same thing without telling you. If you find that your email isn’t getting delivered to people, ask yourself this: have I been sending them things that they didn’t ask for? Lots of humor? Petitions? Warnings? Irresistible pictures and videos? If the answer is yes, then it’s very possible that by using the “Report Spam” button, they’ve convinced their email provider that email from you is spam. Why do I get spam that’s not addressed to me? - Spammers use many techniques to try and slide their garbage into your inbox. BCCing you on messages is one such way. Sounds like your computer/email account may have been ‘jacked. Leo has an article or two (or three or four or…) dealing with this topic. Start here: http://ask-leo.com/someones_sending_from_my_email_address_how_do_i_stop_them.html. There are links to other articles. I had to blacklist my mom…no amount of pleading would stop her from sending me AOL’s new email tracking reward program or eveidence that Obama was born in Pakistan. I catch up with her when I’m removing viruses she got “from her new router”. Spam is unsolicited commercial email. Period. Marking unwanted personal mail as spam is just as wrong as sending jokes and chain letters. Sounds like these spam definitions are mainly from elitists who do not wish to hear from the peasants. Too bad that they have so little time for us senders that care about them and want only to share a funny story or check on their well being. So be it, just block out those folks in your address book. Save your valuable efforts to confort. For most mailers, it only takes a couple of clicks to make a filter from the message. Either the address or topic are never seen again, or you can put the message into a junk folder and peruse that folder at your leisure. At least you’re only making decisions for yourself, not for a bunch of other people who may not want you to decide for them. My ISP considers your mailings spam. Not my idea; I didn’t ask them to do it. You might want to ask yourself what makes your material look like junk mail before under taking to lecture other folks. Tbird considers Leo’s newsletter email every Tuesday to be a scam. It says so in bold letters and also when I click on a link in the newsletter. I suppose I could report it as such instead of taking the millionth of a second it take to press the “ignore warning button”. Maybe I should since I’ll never get that microsecond back! To be fair I don’t get the volume of mail Leo gets and very little of the mail I do get is spam. and any joke etc. from family and friends I treat on a case by case basis. I rarely press the SPAM button since I don’t want “legitimate” mail from my family etc. bounced. If SPAM does make it through my filters then I report it. The only spam I get is with my gmail accounts and that gets filtered to trash automagically. I get no spam on my ISP account or my domain account. The whole issue of Thunderbird thinking a message is a scam (not sPam) is this article: Why does my email program think that this message might be a scam? I got labeled once as a spammer for exchanging emails with a Canadian friend. At the time his ISP had gone to a service called Barracuda to filter their Internet traffic. It was odd timing because he sent me a joke which got to me just fine but when I responded it got bounced back and it said it was returned because I had been labeled a spammer. What I figured out after the fact was that certain words were spam triggers. In this case it was “Viagra” which was in the joke. My friend used animated emoticons all through his emails. The place that provided them, free of course, embedded a link to their site and a little dancing figure at the bottom of all his emails. So a key word plus an embedded link were part of what got me dinged even though both had originated with him and my response was only “Good one!”. What surprised me was that every one of my 5 ISP provided addresses, both my Hotmail addresses, and my Yahoo emails were also bounced for the same reason so it must have looked at the address origination ISP address. I tried contacting Barracuda knowing their stuff was flawed if it was tagging me as a spammer but they would never contact me back. They had just rolled out their service so I’m sure there were lots of bugs to work out. It took me over a week and a dozen emails to his ISP plus him contacting them to get it all resolved but I was finally unblocked. Another time I was sent a job offer -a legit one- and I had to respond within 24 hours because there was another candidate. I was blocked when I tried to respond by something called Black Guard, Black List or something with Black in it. I was bouncing off the walls because it was on a late Friday afternoon when I received the email notice. The HR person’s phone number had a full voice mailbox when I tried to call the number so an email was my only hope. I researched the error code at the site and found out it wasn’t me specifically that was blocked. My entire ISP had been blocked so nothing with an @comcast.net address could get through their company’s ISP servers. There was an appeal form on ther site and a “Please, this is important” type request. Both were not something I could submit as just a private individual. And it was the weekend. I called the Black List people that Monday along with Comcast. Both said “We are aware of the problem and we’re working on it.” I didn’t get the job which sticks in my craw to this day. I haven’t looked yet but I thought there was an article in a recent Ask Leo that said not to mark emails as spam unless they truly were spam because it could have consequences for the sender including being blocked. I read and participate in a number of tech newsletters and tech sites so I am not sure where I read it. I know what Leo is doing makes sense on some level and but I look at the Internet as continually growing and that older folks are finally getting on board. I am especially seeing this on Facebook. Many newbies don’t know proper netiquette yet and haven’t learned that there is a lot of bogus stuff out there. I honestly don’t believe they forward this junk to be annoying or mean. I think they view it the same as sharing a joke or gossip at work or something. While that, too can get bothersome, a punch in the gut isn’t the best way to resolve that even though it’s effective. It seems that getting someone labeled a spammer and possibly nullifying their email address and worse, their IP address and any email access at all is like decapitation for bed-wetting. What lesson do they learn iof they get blown up for doing something us veterans of the cyberworld know better than to do. Have we forgotten we were once new to all this, too? It seems there should be a spam filter light for email programs that would delete the offender’s emails without doing anything else that could affect them. You know, something simple that could handle it locally right on the machine. “it seems to be there should be a warning system such as an email he could send back.” I absolutely agree. And yet when I’ve taken the time to do so all I’ve recieved in return is anger. I can to that a few times, but as a regular practice … no, it’s not something I need. I can’t remember ever getting an email that I ‘asked for’. You send someone an email to find out how they are going – they didn’t ask for it. So by your definition that is SPAM. You’re a long way off base this time Leo. Your wholesale declaring emails you didn’t ask for SPAM, causes a lot of people a lot of grief. Time to re-evaluate your position I think! I’ve never marked them as Spam, but after reading this article I’m tempted. I used to very kindly ask people to not send me this stuff, explaining that I really enjoyed hearing from them, news about their family, etc., but I don’t open any “Forwards” — and they always got angry! Spare me the people who ‘check on my well-being’ by sending some non-funny, dumb joke, a ridiculous chain letter or some hateful piece of religious/political dogma. Elitist? Hardly. Not even that busy, frankly. Just someone who has better things to spend her time on than sifting through a boatload of meaningless crap from people who apparently DON’T have anything better to do than clog up the bandwidth and promote yet more ignorance in this country. I know people whose entire online experience consists of forwarding every joke, story and “warning” they receive from like-minded people, sending out up to 50 of them every day — if that’s not spam, what is? Careful: spammer and scammer are two different (albeit possibly related) things. Thunderbird keeps complaining about my newsletter as a sCam, not as sPam. More here: Why does my email program think that this message might be a scam? Thank you maybe this explains my situation. Are innocent “spammers” ever unblocked? I set info and was told that it would be checked. bid might be around 100 names for 50 bucks. Maybe more maybe less, but neverthless profitably. those other addressees to do with as they please, including passing them out again, or reselling. way one ends up with so much spam to start with. Personally, I’m not likely to ever forget what the “Spam” button is. freinds?? Some, you probably don’t even know. Did you get paid for them? Somebody will. your own name and then wait to see if you got a reply. Hi Leo, a site I have been going to for years has banned me saying I am a spammer. How can I force them to apologize and reinstate me? Report them to abuse.org maybe? Thanks for your time and help. The only thing you would be able to do is try to convince them you’re not a spammer if you have any way of contacting them. There’s no way to force them to let you post on their website. Abuse.org wouldn’t be able to do anything about this as it doesn’t fall under the category of abuse. You might try setting up a new account with them using a different email address. FORCE them? You cannot. Site owners can do whatever they want. I know of no way to make this happen. I have been having my email addresses “spoofed” and someone sending out spam using one of my emails as the return address. Is there any way to stop this, short of deleting the email account? Deleting the email account will not stop it. It’ll just prevent people from being able to reach you. I know of no way to prevent spoofing.